Time never stands still. It keeps on going even as this fantasy tree holds out his arm to you to show you the hour of the day. 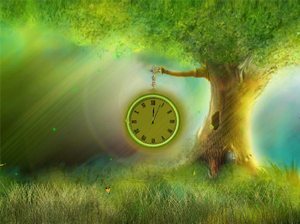 In this animated wallpaper the clock keeps moving as do the butterflies and blades of grass. You do not have to rush, but you do need to make the most of your time in this magical environment.